Still Time to Register for the Panhandle Fruit & Vegetable Conference! Register today for the 2018 Panhandle Fruit & Vegetable Conference! The Panhandle Fruit & Vegetable Conference is scheduled for February 19th & 20th. On the 19th we will go on an afternoon farm tour in Baldwin County, AL that will end with dinner (included) at Auburn University’s Gulf Coast Research and Extension Center in Fairhope. 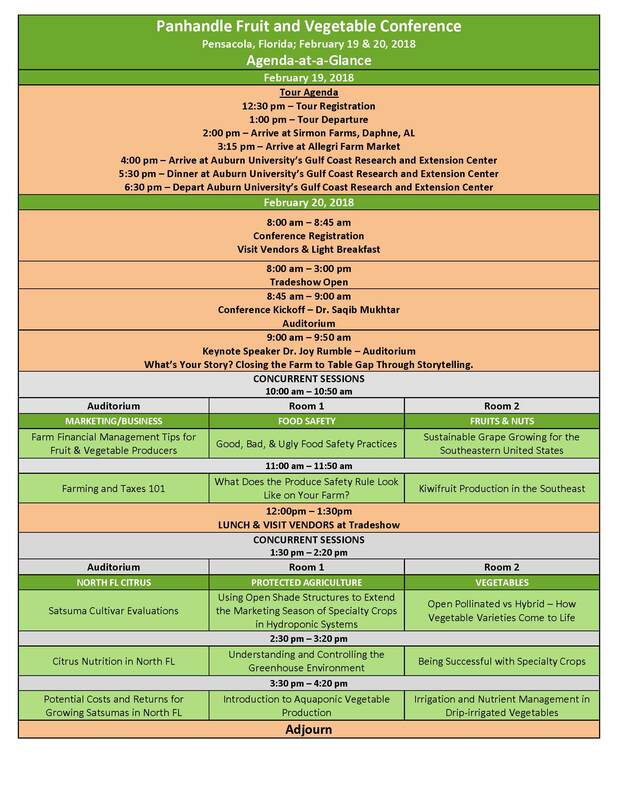 Educational sessions with guest speakers from University of Florida, Auburn University, and Texas A&M University will be held on February 20th where topics will include Citrus Production, Vegetable Production, Protected Ag Production, Marketing/Business, Food Safety, and Fruit & Nut Production. A full list of topics can be found here. Fifty dollars (plus $4.84 processing fee) covers the tour and dinner on the 19th and educational sessions, breakfast, and lunch on the 20th! The complete agenda is now available. Use your mouse or finger to “click” on the image below for full screen viewing. In November 2013, citrus canker was found for the first time in the Florida panhandle in Gulf Breeze in southern Santa Rosa County. The Florida Department of Agriculture and Consumer Services (FDACS) tested and confirmed the disease on grapefruit trees in a residential landscape. Since that time, citrus canker has been confirmed on citrus trees at 27 more locations in Gulf Breeze. To my knowledge it has not been found in any other location in the panhandle. Not yet. 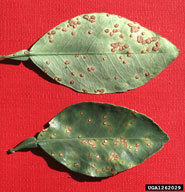 Citrus canker lesions on leaves are raised, rough and visible on both sides of the leaf. Photo by Timothy Shubert, FDACS. Citrus canker is a serious bacterial disease that only infects citrus trees. It will not infect any other plant species nor is it a threat to human health. This highly contagious disease has no cure as yet. Severely affected trees experience substantial leaf and premature fruit drop and serve as a source for infecting other citrus in the area. The disease spreads through wind, rain and transportation of infected plant material from other locations. We do not know how the disease came to infect trees in our region. The disease could have been spread through infected fruit or trees brought here from areas where the disease is established, such as central or south Florida. What should you do if you suspect your citrus is infected with this disease? Look at Homeowner Fact Sheet: Citrus Canker for more information. 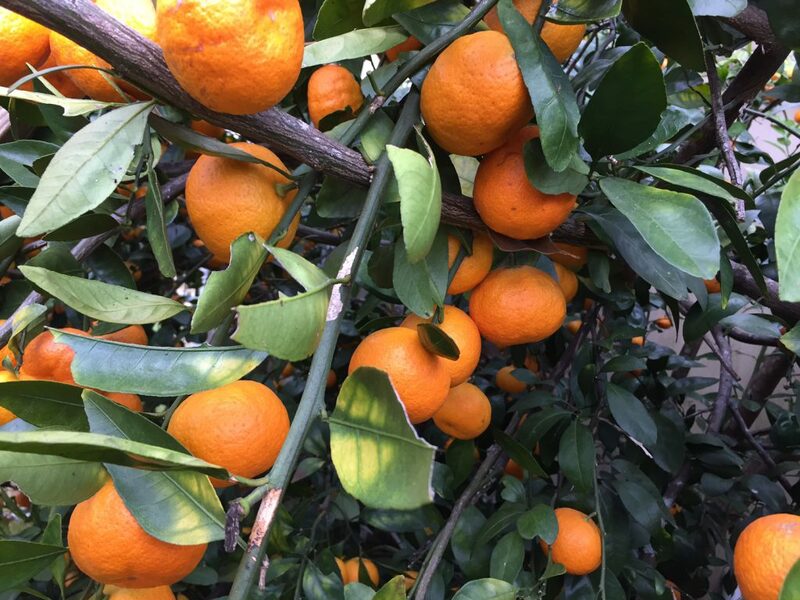 Leave the tree in place in your yard and call the Division of Plant Industry at FDACS at 1-888-397-1517 for a free inspection and testing of your citrus trees. Consult your local Horticulture Extension Agent for more information and control/removal strategies. Proper removal of infected trees is recommended to prevent the spread of citrus canker but is not mandatory. If we look at the big picture when it comes to invasive species, some of the smallest organisms on the planet should pop right into focus. A microscopic bacterium named Candidatus Liberibacter asiaticus, the cause of Citrus Greening (HLB), has devastated the citrus industry worldwide. This tiny creature lives and multiplies within the phloem tissue of susceptible plants. From the leaves to the roots, damage is caused by an interruption in the flow of food produced through photosynthesis. Infected trees show a significant reduction in root mass even before the canopy thins dramatically. The leaves eventually exhibit a blotchy, yellow mottle that usually looks different from the more symmetrical chlorotic pattern caused by soil nutrient deficiencies. One of the primary vectors for the spread of HLB is an insect called the Asian citrus psyllid. These insects feed by sucking juices from the plant tissues and can then transfer bacteria from one tree to another. HLB has been spread through the use of infected bud wood during grafting operations also. One of the challenges with battling this invasive bacterium is that plants don’t generally show noticeable symptoms for perhaps 3 years or even longer. As you would guess, if the psyllids are present they will be spreading the disease during this time. Strategies to combat the impacts of this industry-crippling disease have involved spraying to reduce the psyllid population, actual tree removal and replacement with healthy trees, and cooperative efforts between growers in citrus producing areas. You can imagine that if you were trying to manage this issue and your neighbor grower was not, long-term effectiveness of your efforts would be much diminished. Production costs to fight citrus greening in Florida have increased by 107% over the past 10 years and 20% of the citrus producing land in the state has been abandoned for citrus. 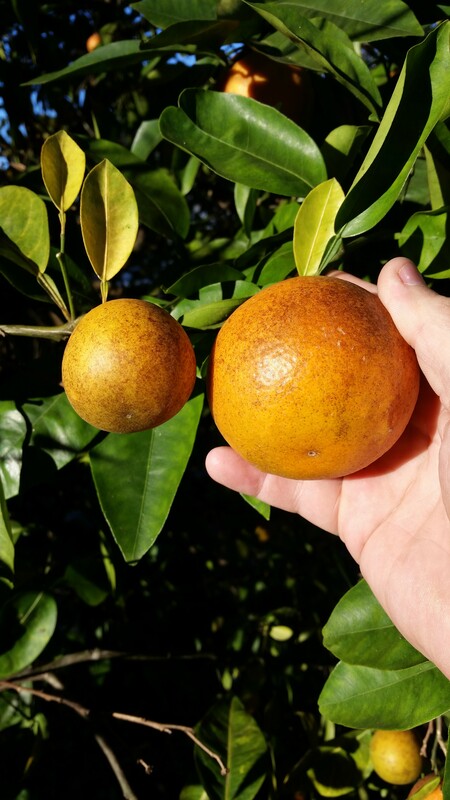 Many scientists and citrus lovers had hopes at one time that the Florida Panhandle would be protected by our cooler climate, but HLB has now been confirmed in more than one location in backyard trees in Franklin County. The presence of an established population of psyllids has yet to be determined, as there is a possibility infected trees were brought in. A team of plant pathologists, entomologists, and horticulturists at the University of Florida’s centers in Quincy and Lake Alfred and extension agents in the panhandle are now considering this new finding of HLB to help devise the most effective management strategies to combat this tiny invader in North Florida. With no silver-bullet-cure in sight, cooperative efforts by those affected are the best management practice for all concerned. Vigilance is also important. If you want to learn more about HLB and other invasive species contact your local UF/IFAS Extension office. Should I prune my trees? Why are the leaves yellow? How soon should I fertilize? The focus of this article is to provide some answers to these common questions. This is a complicated question that is best answered with “it depends…” Pruning is not necessary for citrus, as it is in many temperate fruits, to have excellent production quality and quantity. Citrus trees perform excellently with minimal pruning. 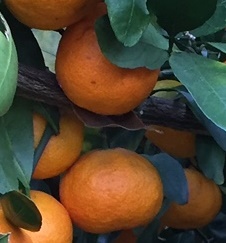 The only pruning necessary for most citrus is removing crossing or rubbing branches while shaping young trees, removing dead wood, and pruning out suckers from the root-stock. Homeowners may choose to prune citrus trees to keep them small, but this will reduce potential yield, since bigger trees produce more fruit. Often, maturing Satsuma trees produce long vertical branches. It is tempting to prune these off, since they make the tree look unbalanced. To maximize yield, allow these branches to weep with the heavy load of fruit until they touch the ground. This allows increased surface area for the tree, since the low areas around the trunk are not bare. Additionally, weeds are suppressed since the low branches shade out weed growth. The ground under the trees remains bare, thus allowing heat from the soil to radiate up during cold weather events. The extra branches around the trunk offer added protection to the bud union as well. If smaller trees are desired for ease of harvest, ‘flying dragon’ root-stock offers dwarfing benefits, so that the mature scion cultivar size will only grow to 8-10 feet tall. Heavy fruit loads were produced in many home gardens throughout Northwest Florida last year. When fruiting is heavy, citrus trees translocate nitrogen and other nutrients from older leaves to newer growth and fruit. Therefore, temporary yellowing may occur and last until trees resume growing in the spring. Remember, never fertilize after early September, since fertilizing this late in the year can reduce fruit quality and increase potential for cold injury. 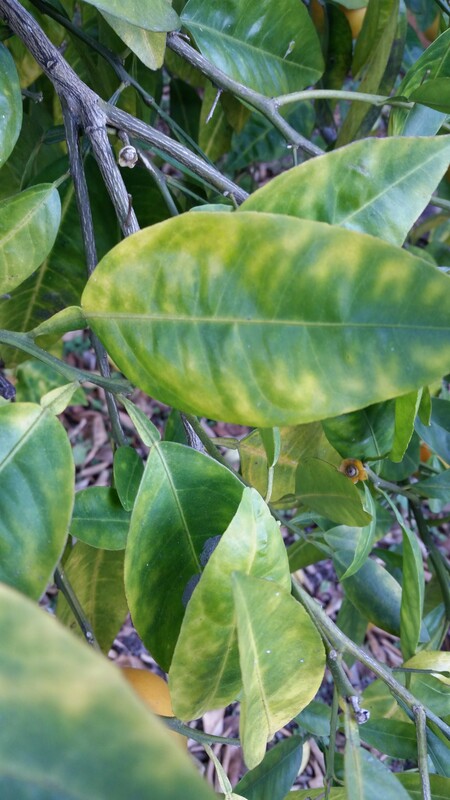 If a deficiency, as in the photo above persists through spring, consider a soil test, or consult a citrus production publication to determine if additional fertilizer should be added to your fertilizer program. How soon should you fertilize? Although most Florida citrus publications recommend fertilizing citrus in February, they don’t take into account the potential for late frost in the Panhandle. Thus it makes more sense to wait until mid-March for the first fertilizer application in this region. Citrus trees don’t require a fertilizer with a high percentage of nitrogen, so it is best for fruit quality if an analysis of around 8-8-8 with micro-nutrients is used. Fertilizer should be applied in the drip-line of the tree, not around the trunk. The drip-line of a mature tree is generally considered to extend one foot from the trunk out to one foot from the edge of the furthest branch tip from the trunk. For fertilizer quantity recommendation see the chart below. Through awareness of the unique managements techniques inherent to dooryard citrus production in the Panhandle, home gardeners are offered an opportunity to provide their friends and family with a substantial portion of their annual citrus ! When is the Correct Time to Harvest Satsumas? 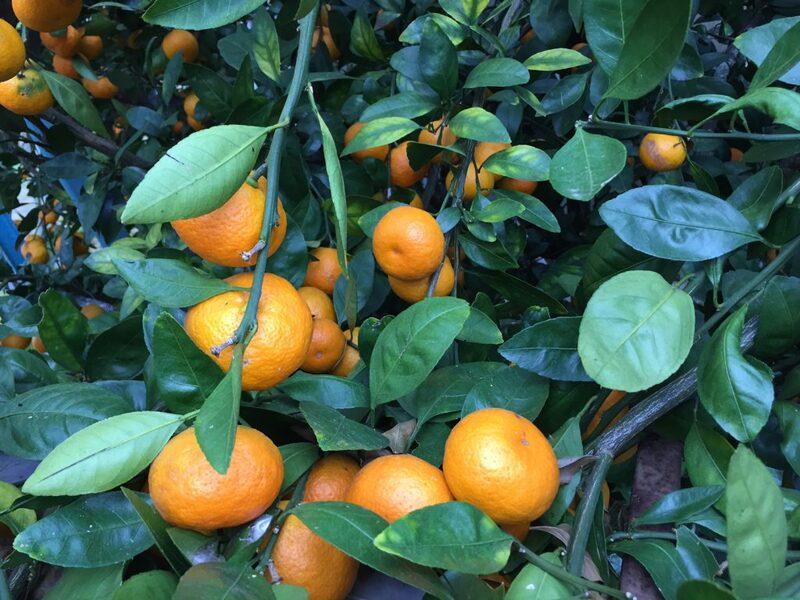 One question that repeatedly pops up in my Extension work is “When do I harvest fruit or vegetable X ?” This fall, the question of “when should I harvest my citrus?” has been a choice topic! The most common citrus in the Florida panhandle is the satsuma, Citrus unshiu, so it makes sense to limit this article to that species. Harvesting satsumas can be a confusing activity for new citrus enthusiasts. Fall seasons in the panhandle tend to be extremely variable, from cold and wet to warm and dry or any combination thereof. To complicate matters, citrus is often grown in a protected microclimate in the garden. Thus, another variable is added to the decision tree. When satsuma ripen, they become slightly soft. That’s a good indicator that they are ready to harvest. This softness makes them extremely easy to peel but poses a challenge when harvesting. If they are simply pulled off of the tree, some peel will be left on the tree and the fruit will be compromised. Such a fruit would have to be consumed quickly. To solve this problem satsuma are clipped off the tree, leaving a tiny bit of stem attached to the fruit. This allows the fruit to be stored and transported. When a hard freeze is approaching (5 hours below 28ºF), it is important to harvest the fruit before this event whether or not they are ripe. Hard freezes will ruin the texture of the fruit and cause them to begin the rotting process. Since a hard freeze is forecast for Friday December 9th 2016 for part of the Florida Panhandle, consult your local weather forecast and make your decisions accordingly. For an in-depth discussion on citrus fruit harvesting and cold tolerances, please consult this publication from Texas A& M University. Additional articles are available on cold protection and frost readiness here. 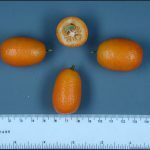 Nagami kumquat. Photo credit: UF/IFAS. Satsuma mandarin is cold hardy to 15°F once established. There are a few different available cultivars with fruit ripening October through December. Fruit needs to be picked promptly when ripe. 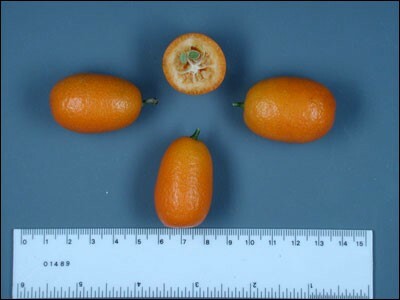 Kumquat is cold hardy to 10°F once established. ‘Nagami’ and ‘Meiwa’ are the two common cultivars of the small tart fruits. Fruit matures in fall and winter and holds fairly well on the trees. Calamondin is a lesser known variety that bears small fruit that resemble tangerines. The tart fruit is great for jams and chutneys. Fruit is borne all year. Some of the sweet oranges that do well in the panhandle are Navel, Hamlin and Parson Brown. They are cold hardy to 14°F once established and are harvested November through January. Minneola or Honeybell tangelo is also hardy to 14°F and harvested in January. 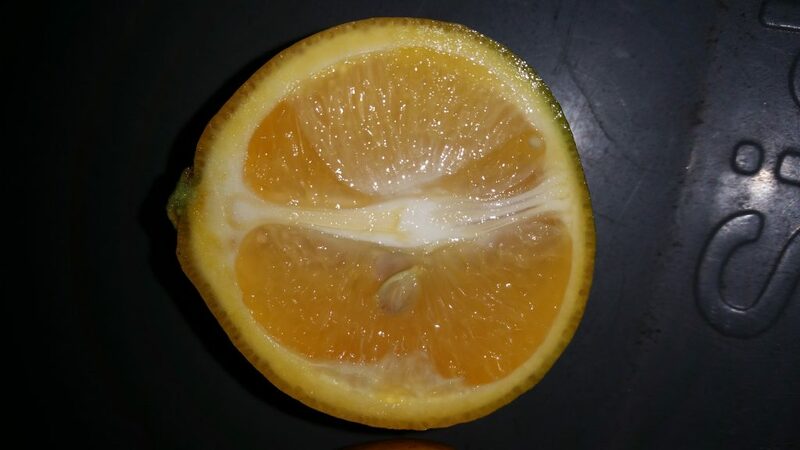 This is a cross between a Duncan grapefruit and a Darcy tangerine. This bell-shaped fruit is very juicy and sweet. Unlike the other citrus varieties, it needs another citrus nearby for cross-pollination in order to produce an abundant crop. Meyer Lemon is the choice to make if you would like to grow lemons in the panhandle. Other lemons may be damaged by our occasional freezes. Grapefruit and lime can be grown – although unreliably – on the coast with protection from northwestern winter winds. They are much more susceptible to freezes in more northerly panhandle locations. In order to have the healthiest and most productive trees, learn about how to properly care for citrus and how to recognize and combat the pests and diseases that occur. There are threats to our dooryard and commercial citrus from pests and disease. Only vigilance will help to combat the challenges so that we may continue to grow and enjoy our citrus. What can we do to protect our citrus? Report any serious diseases like suspected citrus canker or citrus greening to the Division of Plant Industry by calling toll-free 1-888-397-1517. Inspections and diagnosis are free. Citrus canker has been confirmed in south Santa Rosa County in the past 3 years. Purchase citrus trees only from registered nurseries – they may cost a little more but they have gone through an extensive process to remain disease and pest free. That will save you $$ in the long run! Don’t bring plants or fruit back into Florida – they may be harboring a pest! Citrus trees or fruit cannot move in or out of the State of Florida without a permit. This applies to homeowners as well as to the industry. This rule protects our vital dooryard trees and citrus industry.